Grease an 8″x8″ baking pan or 9″ pie plate. In a medium bowl, combine flour, brown sugar, oatmeal, cinnamon, and melted butter. Mix well with a fork so that all the dry ingredients are evenly covered with the melted butter. Press half the mixture (approx. 1-1/2 cups) into the greased baking pan for the crust. Have your cleaned, chopped rhubarb ready. In a medium saucepan, combine the white sugar, water and cornstarch. Cook over medium heat until very thick and translucent, stirring frequently, about 4-6 minutes. Add the rhubarb and vanilla, stir, then spread over the crust. Sprinkle the remaining oatmeal mixture over the top. 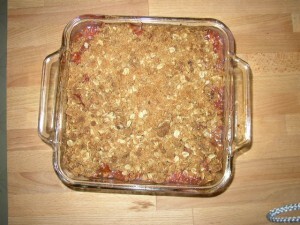 Bake at 350°F for 1 hour or more (until rhubarb is bubbling and topping is nicely browned). NOTE: I like to place the baking pan on top of a foil-lined baking sheet to protect my oven against possible spills from over-flowing rhubarb juice.